Pelicans-Warriors made 41 three pointers while Nets-Rockets attempted 106 shots from three. 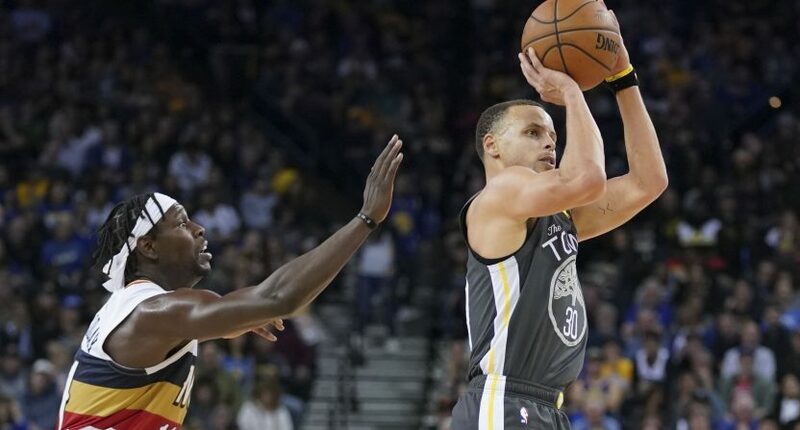 If you want a scoring master class, look no further than what the New Orleans Pelicans-Golden State Warriors and the Brooklyn Nets-Houston Rockets did Wednesday night. The Pelicans and Warriors combined for an NBA record 41 total made three pointers as the Warriors defeated the Pelicans 147-140. This came after the Warriors scored 142 points the night before in a win in Denver against the Nuggets. The Nets and Rockets combined to break the NBA record for total attempted three pointers with 106 attempts in the Nets 145-142 victory in OT. Just simply amazing. You have to feel for the Pelicans and Rockets because it’s not every day a team scores over 140 points in general. So you would think that if you score 140 in a game, you’re guaranteed to win. That wasn’t the case tonight. In the Pelicans-Warriors game, a total of 11 players from both teams were able to score in double digits, with six of them scoring more than 20. Steph Curry led everyone with 41 points including going 9 for 17 from three, with Kevin Durant and Anthony Davis both having 30. Off the bench, Nikola Mirotic finished with 29 points for the Pelicans. For the Nets-Rockets game, 12 players scored double digit points including all five Nets starters and James Harden scoring 58 points. The game was especially notable for point guard Spencer Dinwiddie, who came off the bench, scored 33 points, including 11 in the final 30 seconds in regulation to get the game to overtime and scoring 25 points in the fourth quarter and overtime. Among the 106 three point attempts, Houston attempted 70 of them and their “live by the three, die by the three” strategy almost worked. These two games still aren’t going to go down in history as the highest scoring NBA games ever but the fact that these 287 point performances took place on the same night shows the added importance of being able to shoot and especially shoot for three. It isn’t the kind of play that defensive purists will appreciate but if you want high scoring and a finesse shot from deep, you got your fill Wednesday night.